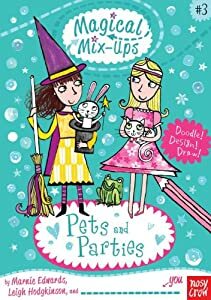 In Magical Mix-Ups: Pets and Parties you can Doodle, design, and draw while you read and make Sapphire’s birthday wish come true! Princess Sapphire and Emerald the Witch live in the mixed-up land of Mixtopia, where everything is just a little bit odd. It’s Sapphire’s birthday, and she longs for a pet of her own. Emerald’s present is the next best thing — tickets for an amazing animal magic show! But the star — a performing cat! — has mysteriously disappeared. What a mix-up! Only you can finish the illustrations and make sure Sapphire’s birthday is perfect! My eldest daughter though that this book was so much fun because not only does she get to read, but she also gets to use her artistic abilities as well (both of which are things she loves to do). The story was fun and the book engaging. The authors have done a great job making something that is more than a book, they make it fun and interactive, and I think best of all, they make it ok to write inside of the readers' book which we all know is not always allowed.